Some people are confused when they hear the words, “dry” and “curry” uttered together. I am not really certain why; if one eats either Thai or Indian foods often, there are plenty of dishes that are called “curry” that are not soupy with gravy or sauce, but dry, with spices or spice pastes clinging to the main ingredients. But there are people out there who think “curry” and instantly think “gravy,” and think of a nice soupy dish poured over some kind of rice that is spicy and warm and good, and that is all there is to it. Except, that isn’t all there is. In Thailand, there are lots of dry curries. And honestly, I have yet to meet one that I haven’t liked. One that I am particularly fond of is mu pad prik king, which translates literally to “pork fried chile ginger.” Or, in plain English, stir fried pork with chile ginger paste. 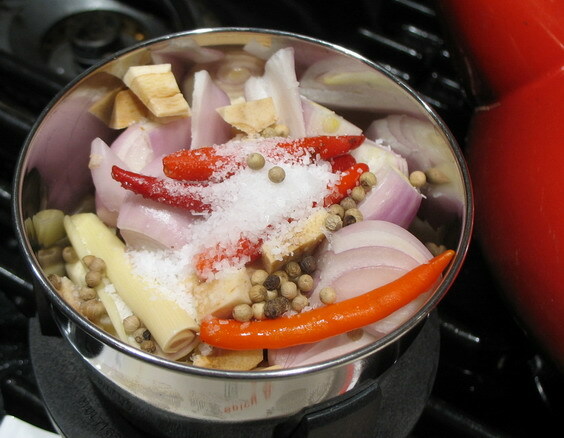 The main flavorings, however, in the dry curry paste are not chile and ginger, but are chiles, galanal, garlic, shallots, lemongrass and lime zest, though of course, there are other ingredients. The ever-present shrimp paste is one, cilantro roots (or stems, as I was forced to use) are another, with white peppercorns bringing up the rear. An unusual ingredient that is, according to Chef Victor Sodsook, used in the countryside is pork cracklings, which are the solid, browned leavings from rendering lard. Lacking those, I used a teaspoon of bacon grease–and was surprised to find that it really did add a great deal of flavor to the finished dish. The making of any dry curry is simple, once the curry paste is managed. Again, I recommend the Sumeet grinder for anyone who makes large amounts of Indian, Thai or Mexican foods–any cuisine where seasoning pastes are regularly made is one that can be simplified by the use of one. I know that there are cooks who swear that using a mortar and pestle is relaxing, but I know that with my carpal tunnel as bad as it is, I would never cook Thai food from scratch if I had to crush every curry paste ingredient by hand. I just know it–and I am a patient, methodical and obsessed cook. Which means if I wouldn’t do it–neither would most people. 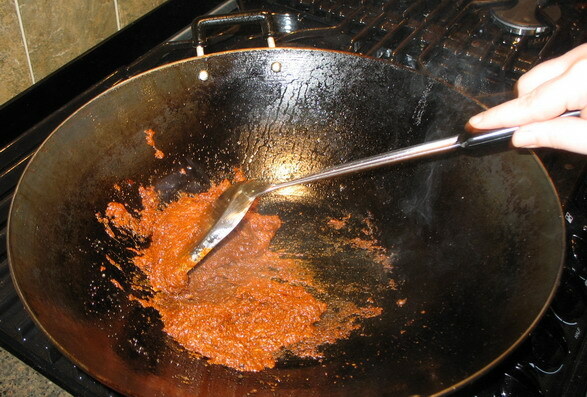 Once the curry paste is made, however, the procedure is quite simple. It involves heating up a wok, adding oil, and cooking your protein item, whether it is meat, fowl, seafood or tofu, about halfway, then removing it to a bowl. Then the curry paste is added, and stir fried until it dries out slightly and darkens a bit. It is seasoned to taste with palm sugar and fish sauce. A few spoonsful of water are added to rehydrate it, then the protein ingredient is added again, and stir fried until done. Then, blanched or steamed vegetables are added, stir fried a bit, some lime juice is added, and the food is turned around the wok one or two more times, then scraped into a serving platter and decorated with the appropriate garnishes. In the case of mu pad prik king, blanched string beans are added along with crushed peanuts and slivered lime leaves. Lacking lime leaves as I did–cilantro will do. It lacks the floral sweetness of lime leaves, but the fresh scintillating green of it is an excellent contrast to the sharp, very intensely flavored dry curry. Dry curries are meant to be eaten with a large amount of rice. A spicy clear soup like tom yum goong (hot and sour shrimp soup) would go admirably with it as well. This was the first time I had made this particular curry and both Morganna and I loved it. I added fresh shiitake mushrooms to the dish, and while I adapted the paste from Kasma Loha Unchit’s Dancing Shrimp, I also used the pork fat idea from Victor Sodsook’s True Thai. For the curry itself–I adapted it from Kasma’s version using shrimp. Instead of steaming the beans and using them as a garnish, I blanched them and threw them into the stir fry. As noted before, I had no lime leaves, so I used cilantro instead, and I added not only the pork fat to the curry paste, but also the white peppercorns, and four Thai bird chiles for heat. We had a lot of leftovers, mainly because Zak was too tired to eat (he was arguing with our plumbing all day–he won, but I think his back is the worse for the victory), and Morganna was feeling rather blah as well. I think that the only thing I will change about the recipe next time, is that I will not use all of the curry paste as Kasma directed me to. I think it was slightly too much. It was very good, but very, very overwhelming. I think I would use only 2/3 of the recipe and use the rest for some other flavorful purpose sometime later in the week. No matter–we all liked it and the leftovers will do admirably for supper tomorrow–I promised Morganna that I would make Hillbilly Fried Rice for us, so stay tuned, and see what happens when you set a hillbilly loose in a kitchen with a wok, some bacon, a mess of greens, a pile of rice and various Asian leftovers. If you don’t have a Sumeet, chop up your soaked chiles, then one at a time, in order, grind the ingredients into a paste using a mortar and pestle–or alternatively, grind it as far as possible with a blender, and finish with a mortar and pestle. If you have a Sumeet, grind them into a paste. Heat wok until smoking, add oil. Heat until oil shimmers and dances from the heat of the wok. 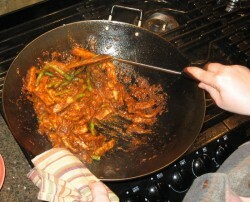 Add pork, and stir fry until it is about halfway done–half of the pink will be gone. Remove from the wok, draining most of the oil back into wok. Set aside. Add curry paste (2/3 of it, or all of it, as you see fit), and stir and fry for about three minutes, until it darkens slightly, dries out a bit and is very, very fragrant. As it dries, add about 2 tablespoons of water, and continue cooking until the three minutes is up. Season with smaller amounts of fish sauce and palm sugar. Add the pork back to the wok, along with the curry paste, and add the mushrooms. 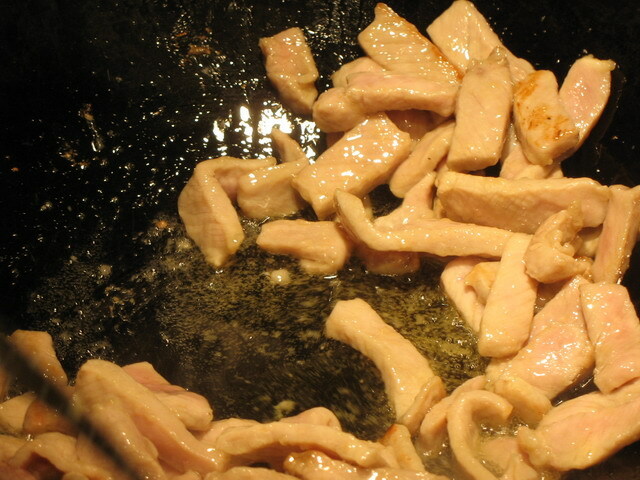 Stir fry, about two minutes, until the pork is really starting to firm up–test a piece between your fingers. If it still feels flaccid in the middle, it is underdone, but if the meat is springy to your touch, it is done. Add the beans and stir fry. Taste the sauce. If necessary add more fish sauce and/or more palm sugar. Add the juice of one lime, then scrape into a serving platter and garnish with peanuts and cilantro. Serve with generous amounts of steamed jasmine rice. Wow, that looks so tasty. I live just down the street from the #2 rated Thai restaurant in Chicago, but your Thai cooking looks even better than what they have served me. It was funny because one day I was in there for lunch and the thai employees who work there were sitting at the table near the kitchen door and they were eating their own lunch. You could tell that plate after plate of what was coming out of the kitchen was not available on the menu. I wish I could ask them for things that aren’t on the menu, but sometimes it is a victory just to get them to understand that you don’t want cilantro on your pad thai or that my vegetarian boyfriend doesn’t want egg in his tofu. I can just imagine trying to request something like you just made without myself knowing how to pronounce thai dish names very well. I just recently started reading your blog. I linked to it from food_porn on LJ. I admire your writing and also your husbands art work. Nine Lives Many Masters had me cracking up. I also wanted to thank you for referring me to the books you mentioned in your previous award winning post. I am currently devouring “Food Politics”. Anyway just saying hello, thank you, and complimenting your food_porn. I usually grind my paste with a mortar and pestle but lately I’m finding this to be quite tedious. There were several models of sumeet grinder from the link you provided. Which model do you recommend? Is it really worth getting one? Thanks. Sharon–I have the Multi-Grind, which is one of the smaller of the Sumeet line. It is a great little machine–it has come down in price since Zak bought me mine six or seven years ago, and it is still truckin’. It never chokes or fails and it has ground everything I have put into it, including soaked grains and dried lentils. It is marvelous. I mean it. I don’t get a penny from Sumeet for saying these things–it is just the truth. The thing is a Godsend to people who cook Indian, Thai and Mexican foods, literally. There is no other way to put it. And on top of it all–it is simplicity itself to clean. Rinse the grinding components and pop them in the top shelf of the dishwasher. Boom. Done. Benjamin–thank you so much for posting. I very much appreciate hearing what readers have to say, and I am glad you have started reading here. I hope you continue to visit and enjoy what you find. In my experience, most Asian restaurants do not serve to patrons the homestyle recipes that the employees eat. Sometimes, after you are a repeat guest at a restaurant, and develop a rapport with the owner or waiter, you can talk them into letting you try what you see others eating–but it doesn’t happen often. I have always been given the Chinese menu when I ask for it, and have never had problems with the restauranteur trying to dissuade me from ordering something. I do not know if Thai restaurants have second menus or not. They might. You might try asking, and see what happens. Another thing that I have managed in Chinese restaurants is to just ask about a dish. If I know the name, fine, if I can describe it, that is usually good enough, and if they have the food and the chef knows how, they will happily make it. I have not tried this in a Thai restaurant, but it may work the same way. I am glad you are enjoying that book–all of the books in that list are excellent. Food politics is a subject that I am passionate about, but I don’t write about it as much as I could, because it irritates me so much that I get very cranky when I get into it. But, this May is another “Eat Local” Challenge, so look for more book reviews on political topics and more essays on the subjects of sustainability and local food than I have been writing recently. I just wrote a comment in the last post, but I forgot a few things. I think I’m going to get the sumeet grinder–if its that easy to clean, I’ll buy it. I know what you mean about two “menus” at a chinese restaurant. My mother never looks to hard at a menu. She just explains what she wants–granted, it is a lot EASIER when you speak/read chinese. I’ve started paying close attention these conversations. Some chinese restaurants feature special dishes in chinese on strips of paper on the wall (have you ever seen this? maybe this is a chinatown NYC thing). Also, if Zak will let you, can you put up some of his paintings? Several restaurants in SF Chinatown have the strips in Chinese on the wall. In these places, when I say “just tofu and any green vegetables you have” I get great food. Gong hay fat choi, Rose! The special menus on the wall I have seen and ordered from and most of the time, it has worked out well. Hadar–I have done this, and it is good. Sharon–I am really glad to help–and Rose, too–the Sumeet has made life so much easier. I still haven’t got around to trying this yet (I really ought to get a Sumeet so I’m encouraged to make curry pastes), but I did finally figure out a recipe for Mu Pad King that tastes like what I’ve had in restaurants–it turned out that the real keys were the oyster sauce and using two or three times as much ginger as I thought I needed. There are some similarities between the two dishes, but not as many as I might have expected. Mel–I want to try your recipe out. I love the flavors of oyster sauce and lots and lots of ginger! Great combination! I read your blog after tasting Pad Prik King for the first time back in January at Chicago’s Opart Thai House. It’s amazing how many Thai restaurants we have, but they all seem to serve Americanized versions of their dishes. Now, it’s the only thing I order there, cause it’s so darn good! 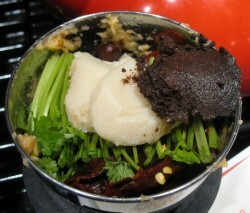 So, I want to make it at home, but I still haven’t bought myself a sumeet or mortar & pestle. I’m thinking about trying the (gulp), canned prik king paste, but from my experience with those, they’re usually too salty. I figured I could doctor it up with some fresh additions, but who knows. Anyhow, thanks for the great post, and I’ll be getting that sumeet soon so I can try out that recipe! 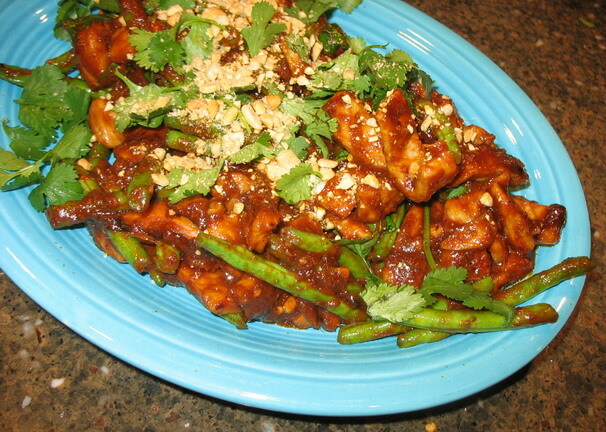 Sarah–I don’t go to many Thai restaurants anymore, now that I cook Thai food at home. It is usually a disappointment. The best Thai restaurants I have ever been to are in Ithaca, NY and Providence, RI. When we lived in Providence, the cook at Siam Square SPOILED us for Thai food. On the other hand, I learned a lot just from eating her food–because I learned great flavor balance from her, and after eating there often, I learned to emulate her cooking style. But since then–eh, I have found very few Thai restaurants that I really, really love. Most of them are only okay. So I cook a lot on my own. Canned pastes–they are not my favorite, really. Mae Ploy brand is pretty good, though–they are packed in resealable plastic tubs, and I do keep a tub of red curry paste from that company in my fridge in case I need to make a quickie curry or something. That brand has a much fresher taste than any others I have tried. If you DID have access to lime leaves (as I do here in Atlanta), what quantity would you use in this recipe? Kathleen–I would use three–and add them after the curry paste, so that their scent would permeate the paste and thus, the entire curry. A couple replies: A Chicagoan, I have not had this at Opart, but can highly recommend the version at Sticky Rice (#1 best thai hands down). They make the northern thai crispy-pork kind and it’s really phenomenal. I had made this at home when I grabbed a random selection of Maesri can pastes, and quite liked it, until I had it at Sticky Rice. I haven’t made this version yet but have bookmarked the page to try next time my CSA gives me green beans.